Anyone who knows me knows I’m not a fan of creepy critters. Of course, I realize if they’re not in my home but rather somewhere outside, then they’re where they’re supposed to be, and I will, mostly, leave them alone. However, about a week ago, I happened to look out my dining room window and noticed a nest of some sort in the city tree at the curb in front of my house. It was quite large – and quite active, with what I thought were bees or yellow jackets busily flying in and out of it non-stop. Turns out, they weren’t bees or yellow jackets. They were hornets. I would assume this would frighten most people. However, for someone like me, with allergic reactions to simple mosquito bites, this was an absolutely terrifying discovery. I calmed myself, though, after realizing, again, that this nest was in a city tree. Naturally, I ASSumed, the city would be responsible for it. I figured they’d want to know about it right away so they could take care of the situation before someone got hurt. 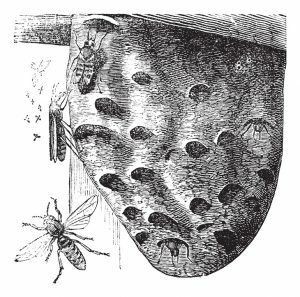 NYC – and other cities, I’m sure – has a policy that hornets fall into the category of “beneficial pests”, which I find both oxymoronic and ridiculous. Yes, I get it. Hornets, as predators, rid us of other pesky flying insects. 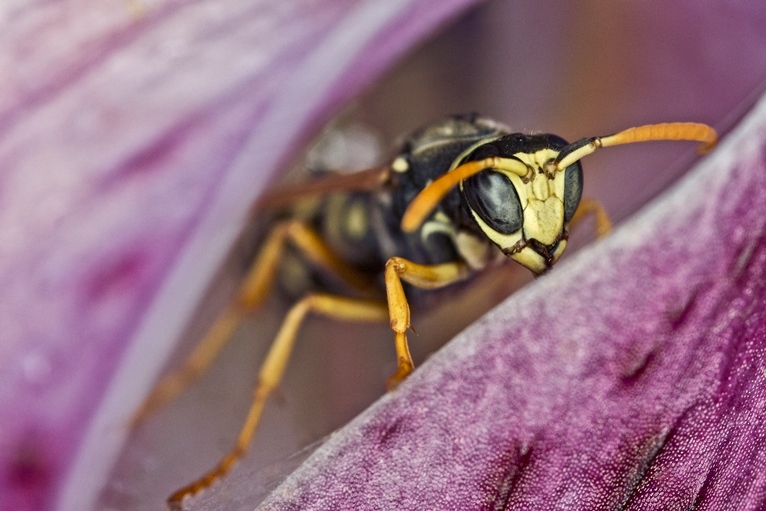 In fact, hornets are so adept at reducing the number of destructive garden pests that the agricultural industry voluntarily uses them as a natural weapon to protect crops. Yes. You read that right; they voluntarily deploy hornets into their gardens/fields as a natural pesticide. Not my idea of beneficial…not when they’re as close as this colony is to my front door, and not when their nest is sitting above a very busy street/walkway where kids ride their bikes and neighbors walk their dogs. I spent this past week on the phone hoping to find a way to get rid of this nest. While I now realize killing the colony isn’t the way to go, my first thought was just that. Destroy the damn thing. I truly believed the city would feel the same way and send someone to spray the nest with something that would completely destroy it and everything inside. Upon calling the city, I was informed that to do anything with this nest, I would first need to apply for a “tree-work permit”. That permit would come from the city, and it would be free. However, I would then have to find someone, on my own, who would not destroy the nest but *relocate* it. And…all costs related to that would fall on me. Once I found someone who would indeed relocate the nest, I’d have to provide their name to the city…and hope for their approval. If they did approve, then I would have to wait for the permit to arrive before any work could be started. Knowing how speedy the city can be, I figured all that might happen somewhere around the winter holidays. If I were lucky. Well, after three days and several more phone calls to 311, I finally received the application for the permit that was supposed to have arrived in my inbox within 24 hours of my first call. Step two – ha. Do you have any idea how difficult it is to find someone to relocate a hornet’s nest? For me, it was impossible. I called various city offices with no luck, and then I called the state. The state was surprisingly easy and pleasant to deal with, and they showed concern and interest regarding my plight. A lovely gentleman I managed to reach by phone even provided me with an email for a beekeepers association. Additionally, through the state’s website, I found emails for a local arborist and for the city’s Parks Department. Unfortunately, after contacting each of these groups, showing pictures and explaining to them how large and active this (to-me) terrifying nest was, and how close it was to my house, they all said that it was too high for them to reach. 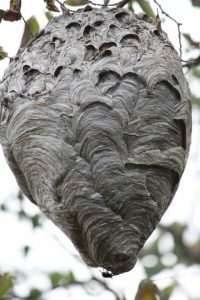 It seems 25-30 feet – which is about the height of this nest – is the natural height for a hornet’s nest and, as such, is unlikely to be dangerous to passersby. Or so I was told. My personal jury is not buying that fact. I was also told, repeatedly, that I should realize – and be comforted by – how beneficial these insects are. I do realize. I’m not comforted. And yet, it seems, I will need to wait until November, by which time the colony should die out, leaving only the queen to hibernate through the winter. Come spring, she’ll go to a new nest somewhere far from my tree. 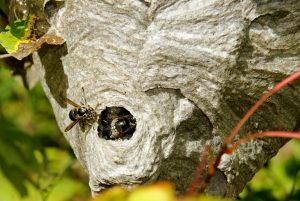 And that is the only plus I see in this whole frightening scenario – that a hornet’s nest is built for single use. Once the colony abandons this one, no hornet will ever come back to it. Until they leave, however, everyone will know where to find me – cowering behind the curtains in my dining room, counting off the days until those killer stinging machines have gone. By the way – while the sight of this nest has me breaking into a fear-filled sweat, it seems these nests are often seen as works of art. It’s true, I suppose, they are magnificent structures – the one in front of my home is the size of a football and the external layers are indeed compelling to gaze upon. 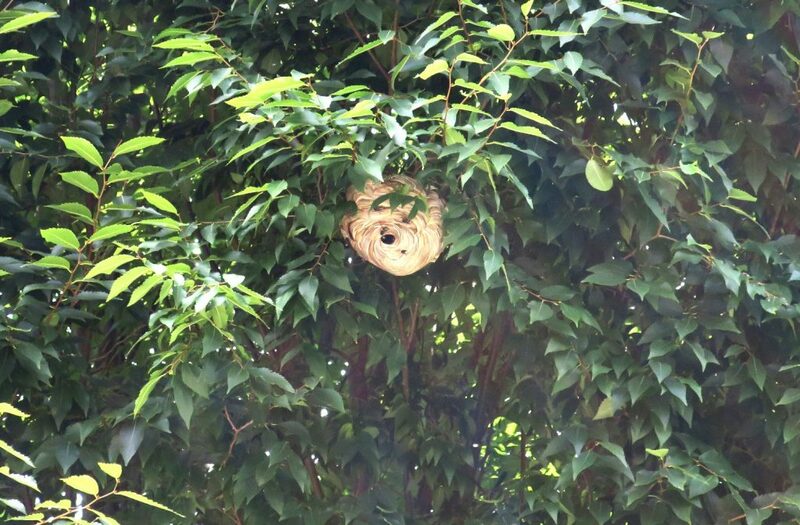 But, apparently, once abandoned, there are some people who have actually taken hornets’ nests down from their trees – or eaves or wherever they happen to be hanging – slice them in half and display them as wall art. FYI – I will not be doing that.